You’ve already heard so many times how people would complain about other people who are addicted to taking photos of themselves. Call it self-love, obsession, vanity or whatever term but you can’t help but be puzzled as to what could possibly be the motivation behind it. There are thousands (or even millions) of other subjects that people could take a picture of but why upload a selfie? They say the Maslow’s Hierarchy of Needs charts what motivates people to do what they do. So, here, we try to make a sense of it by plotting every possible statement that could fit into the model. Level 1: Physiological Needs / Survival – You know how we are as humans: we were built not to forget to breathe. Well, some people were built not to forget to track their daily evolution by snapping a photo of themselves. Level 2: Safety & Security – I almost forgot that as with other forms of photography, they have tons of back-up photos & different poses to choose from before publishing online. Level 4: Self-Esteem, Confidence & Achievement – It’s just sad that these days, people measure their self-worth according to the number of likes & comments on their latest post. I hope you’re not one of them. If you are, close your eyes (not at this particular instant because I’m not yet done with my sentence), breathe in, breathe out & remember how awesome you were before all this online obsession. 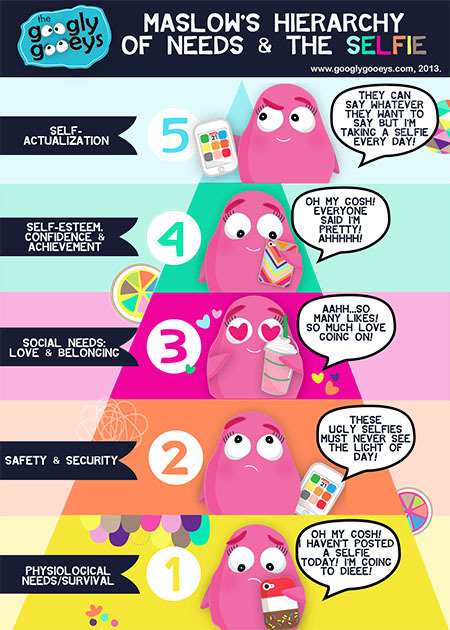 Level 5: Self-Actualization – Well, there you have it: the science behind the selfie. The Instagrammer Goes on a Date! Speaking of selfies, here’s taking it to the next level. I would always be asked if I can do a quick caricature of people & no matter how many times I try, it still looks something this. 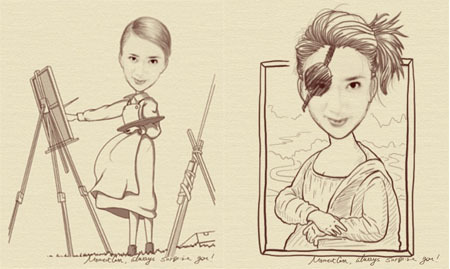 A couple of weeks ago, PinoyScreenCast introduced us to the Moment Cam app & we were surprised as to how quickly you can create caricatures like they would in theme parks but this time, it uses your own photo which makes your features more accurate. Sure, you can replicate the while process manually with Photoshop, a pencil & a pen or a tablet but unless you’re like these awesome people, it will definitely take a longer time. Five Signs That You’re Addicted to Draw Something! Who’s addicted to Temple Run? Raise your phones!